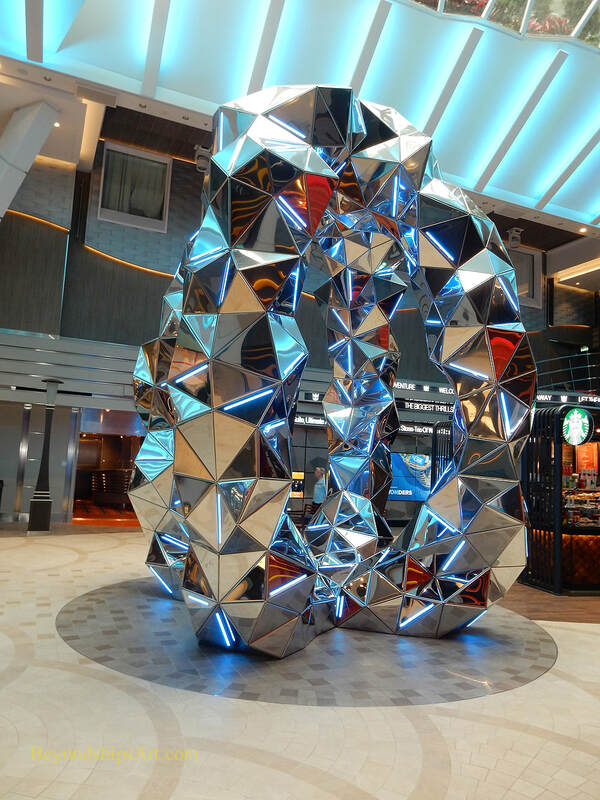 As on the previous Oasis-class ships, Symphony of the Seas has an extensive art collection. It includes 13,347 works, which Royal Caribbean points out is “more works of art than the Louvre.” While the Louvre's collection, which includes countless masterpieces by the likes of Leonardo and Michelangelo, still has a slight edge in terms of quality, Symphony's is not a bad cruise ship collection. Symphony's collection is composed of contemporary art. It was assembled in partnership with Royal's long-time art adviser International Corporate Art. The artists represented in the collection come from all over the world including Albania, Argentina, Austria, Greece, Iceland, India, Italy, New Zealand, Romania, Spain, Ukraine, United Kingdom and the United States. Thus, the variety of voices in the collection is in harmony with the fact that Symphony's passengers and crew are international. Similarly, the mediums used by the artists are consistent with the fact that Symphony was built to incorporate the latest technology. While the artwork includes paintings and sculpture, there are also works incorporating such up-to-the-minute mediums as digital technology and video. The title of the collection is: “The Wonder of Our World, A Journey Into the Unimaginable.” Its objective is to add a new dimension to the areas of the ship, one of the unexpected. “In essence, the art program is taken to a level it has never gone before - - beyond one' imagination,” says Mariangela Capuzzo of International Corporate Art. Accordingly, the collection has a surrealistic element. Even the figurative works are not depictions of reality but rather of dream worlds or of nightmarish visions. They are provocative, sometimes disturbing; not pleasant holiday scenes. The majority of the works, however, are not confrontational. Rather, their abstraction forms and/or colors enhance the areas in which they have been placed. As is true on most cruise ships, the major works in the collection are in the public areas. (There are also prints in the cabins as well as decorative items in the restaurants). A few of the most notable works are discussed below. Passengers enter the ship via the Royal Promenade and so the first work that they see is “Paradox Void” by Gregor Kregar. This 20-foot-tall, three-ton sculpture is made of 1,200 mirrored stainless-steel triangles and 200 sections of LED light strips. A Royal Caribbean tradition is to have a classic vehicle parked on the Royal Promenade. 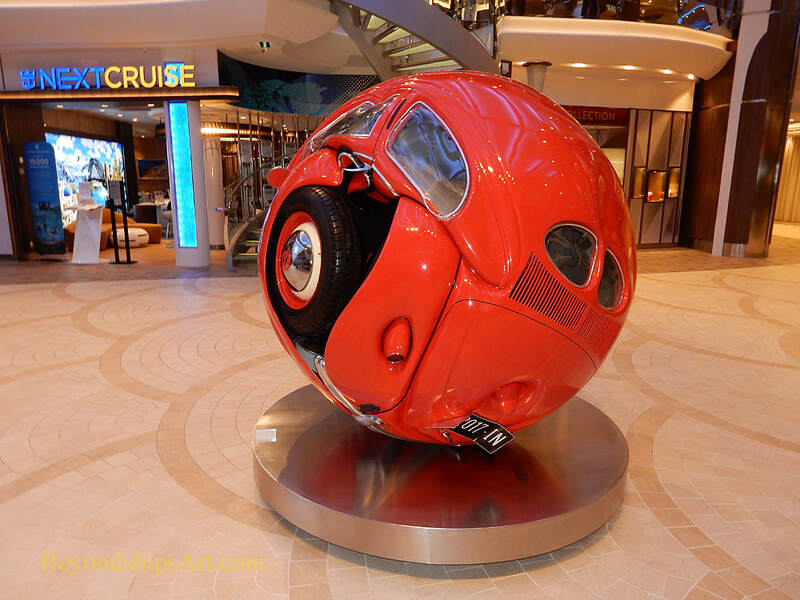 On Symphony, the car is a Volkswagon beetle that has been crushed into a round ball, thus becoming a sculpture rather than a classic car. At the forward end of the Royal Promenade is an atrium and suspended there is an installation by Austrian artist Norbert Brunner made up of inflatable bubbles. Several bubbles contain 120 images each, others feature 20,000 hand-glued Swarovski crystals that spell out different text, and one bubble presents video footage on an LED panel. At the opposite end of the Royal Proenade is another installation, “Kites” by Marcelo Jacome. This consists of 2,200 intertwined kites. The effect is somewhat reminiscent of a colorful origami on a giant scale. For the first time on an Oasis class ship, there is a major work in the Solarium. 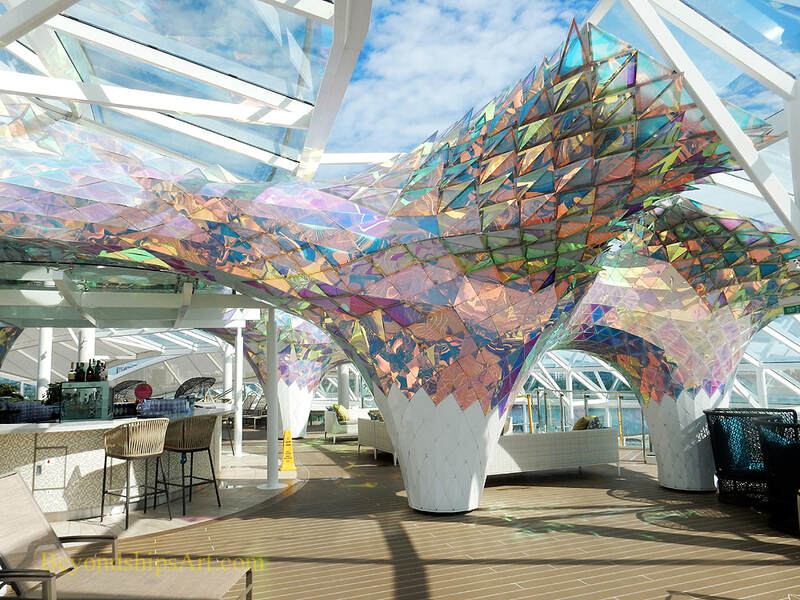 “Big Wonder” by SOFTlab, USA is an architectural installation spanning some 2,594 square feet. It was created from thousands of dichroic acrylic elements. Symphony of the Seas has four stair towers connecting the various decks. 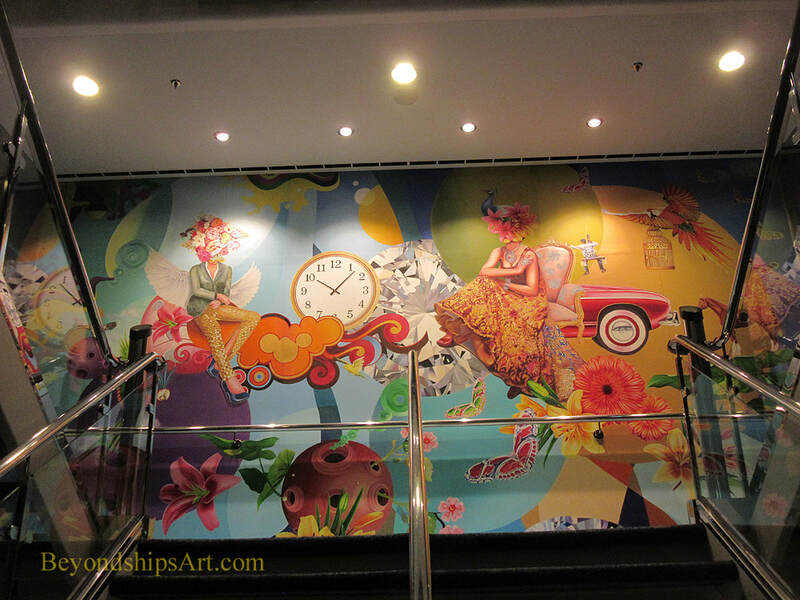 As on other Royal Caribbean ships, there is artwork on each of the landings in the stair towers. On Symphony, works in the towers include sculptural paintings by Spanish artist Nuria Mora; out-of-the-ordinary immersive narrative landings by Indian artist Suraj Kumar; and an adventure in murals by British artist Alexandra Gallagher. Below: The classic car in the Royal Promenade has been transformed into a sculpture. ​Below: An example of the art in the stair towers, Suraj Sumar Kashi's "Inimitable Depiction of Modern Life."